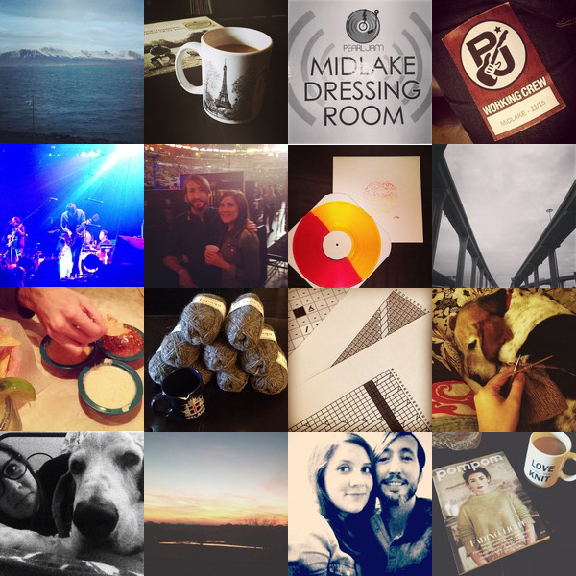 Bet you didn’t notice that I forgot to post an Instagram roundup of my January goings-on. 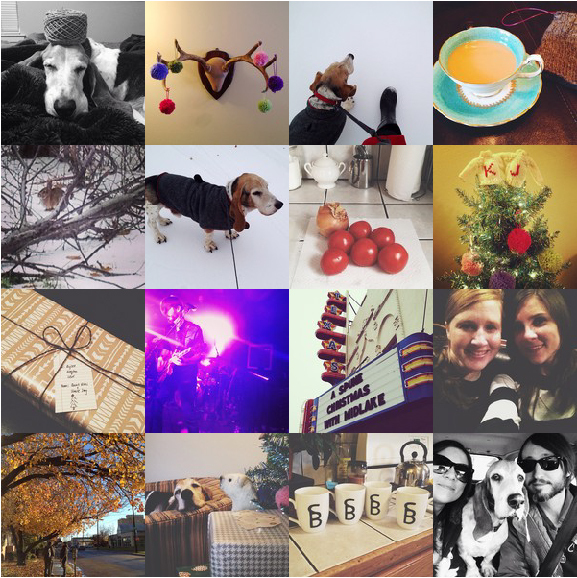 I didn’t notice either, so this time you get January and February smashed into one Insta-double-whammy. (I promise it’s not as painful as it sounds). During the first part of January we were in Aspen, CO where the band played a couple of shows, one of them was a big New Year’s eve bash. The shows were excellent and we toasted the new year in grand fashion. It was such a fun trip and we were even able to squeeze in a visit to a natural hot springs pool nestled in the mountains, and a couple of days of skiing. 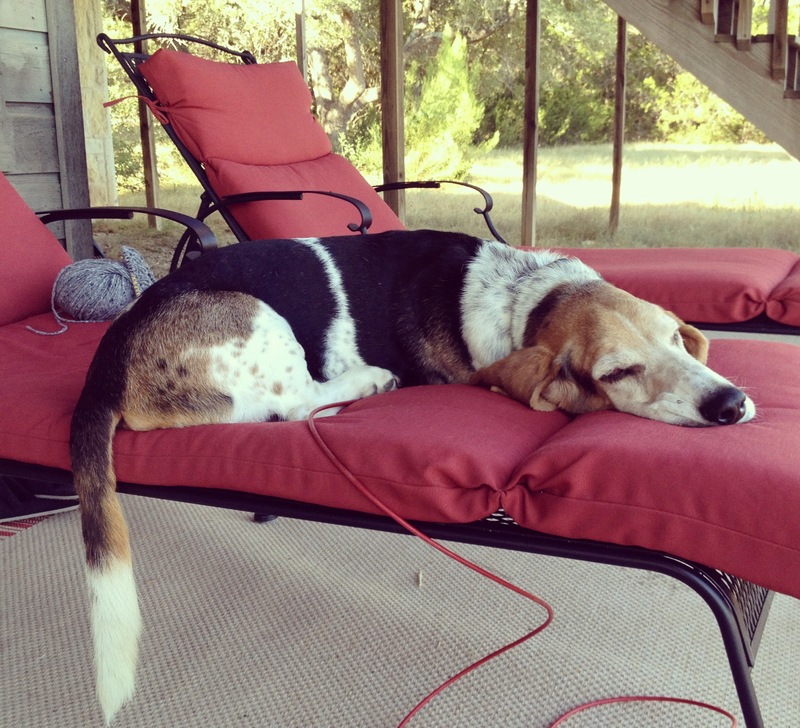 Back home in Texas, I’ve spent the past month and a half working, working, working, with a few stolen moments here and there for doggie snuggles and knitting and crafting. I released my Wayfinder Mitts pattern, re-released my Hill Country Hat pattern, and am wrapping up a new design submission that I’m super excited about. I had a birthday just a few days ago and celebrated with lots of sweet treats, good friends, and wonderful mail surprises from Joey, who is already back out on tour. Now I’m getting ready for some warmer weather (aren’t we all?) and looking forward to casting on a couple of new knitting projects. 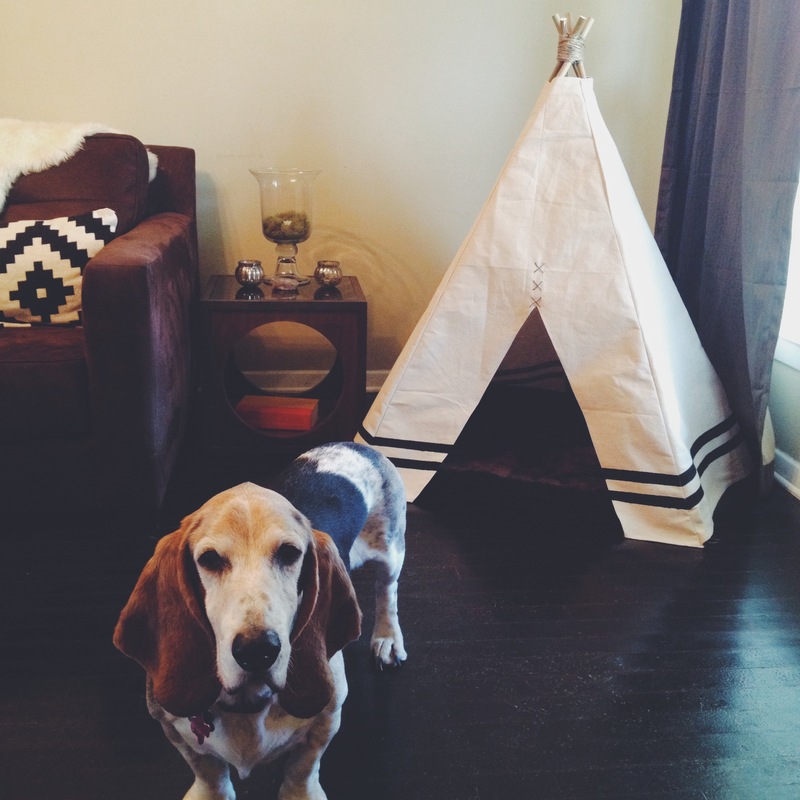 Then I saw a doggie teepee in one of the instagram feeds I follow and I decided that yes, of course, my Henry dog definitely needed a teepee. I just decided to wing it on the construction- I grabbed a few 38” long dowels, some jute twine and a canvas drop cloth at the hardware store. The hardest part was figuring out how to do the cover. I didn’t want to just drape the fabric over the frame so I decided to bring out the sewing machine and sew a bunch of triangles together. I also decided to paint some black stripes along the bottom and stitch on a few reinforcements above the slit for the opening. 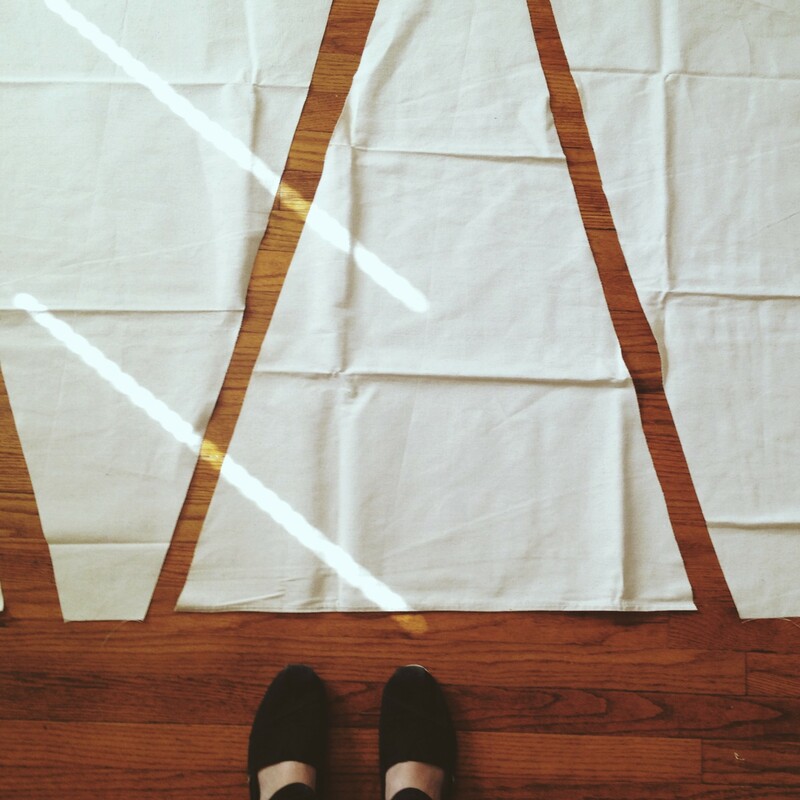 It’s not perfect- I’m too impatient when it comes to sewing to care about making sure my seams are lined up. 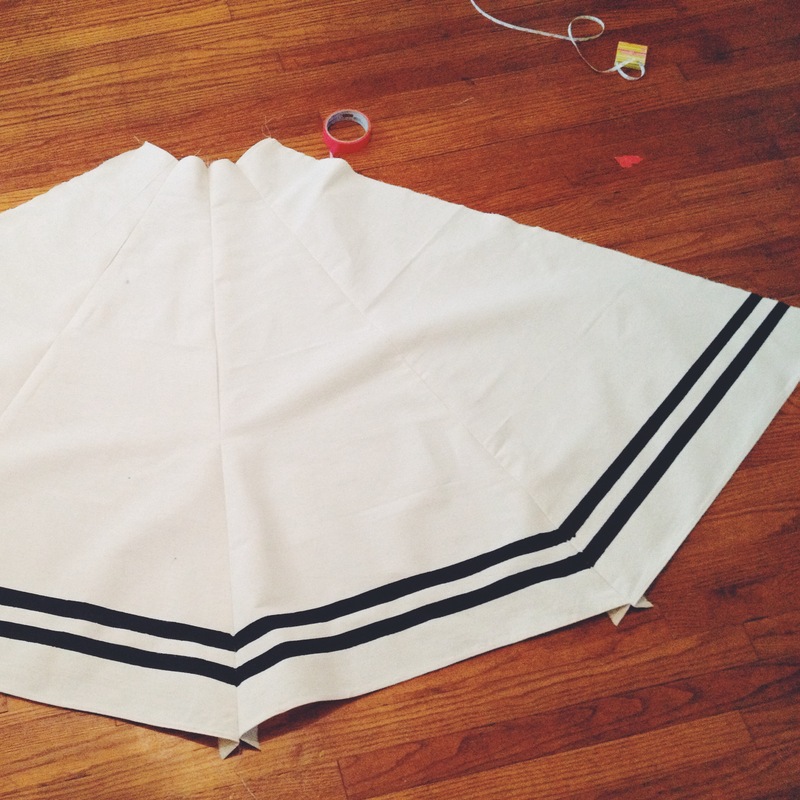 Heck I didn’t even properly measure before I started cutting out the fabric pieces. Such is life when it comes to inspiration. No stopping to plan or measure, just make, make, make. 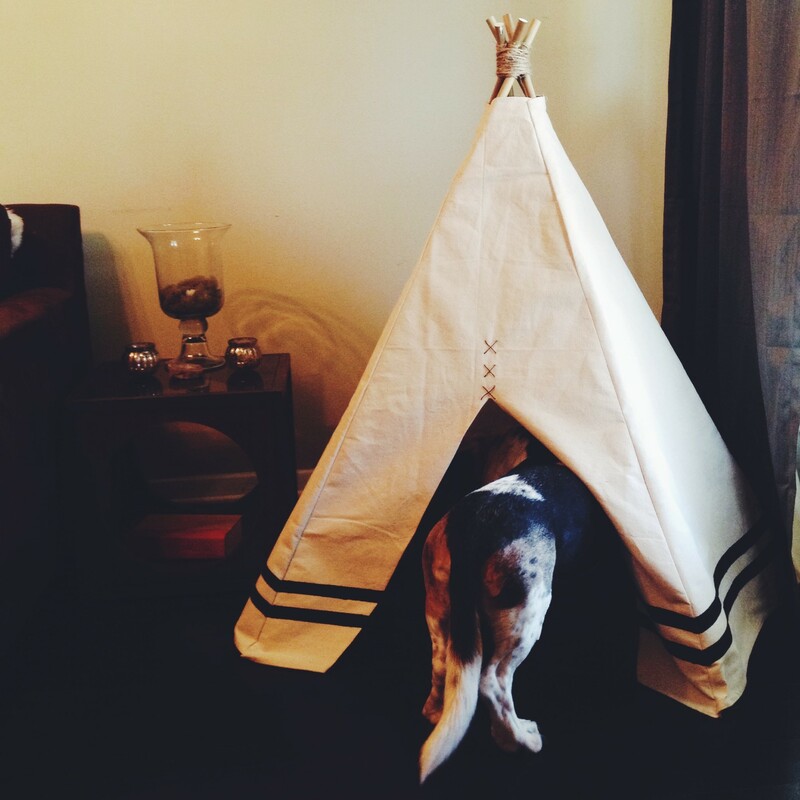 I think it turned out really cute and it looks like Henry likes it too. Now off to plan for that yurt. I’m excited to finally share the article I wrote for the Spring 2013 issue of Pom Pom Quarterly! I’d like to add a note that the album that the article discusses, Israel Nash’s Rain Plans is now out via Loose Music in Europe. As a knitter married to a touring musician, I try to join my husband on his travels as often as my schedule will allow and I always bring my knitting along for the journey. 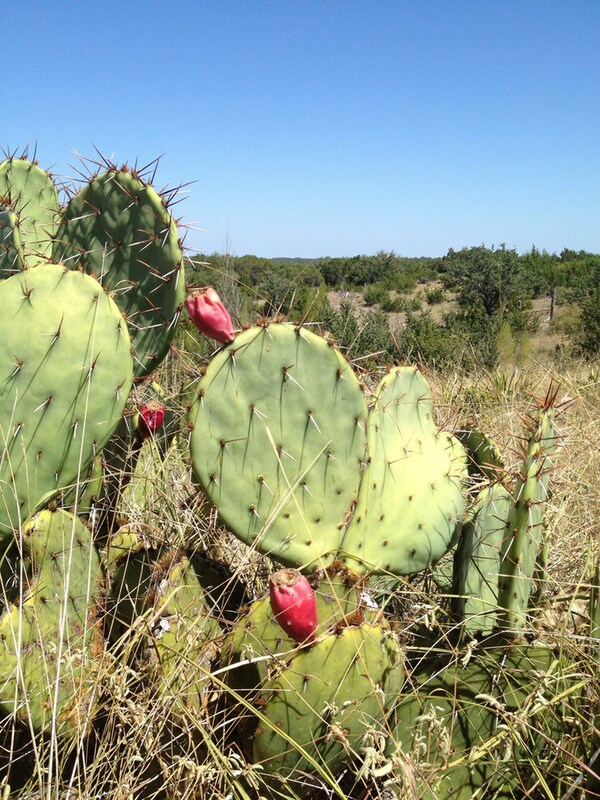 This particular trip finds us down in Texas Hill Country about an hour’s drive outside of Austin, Texas. 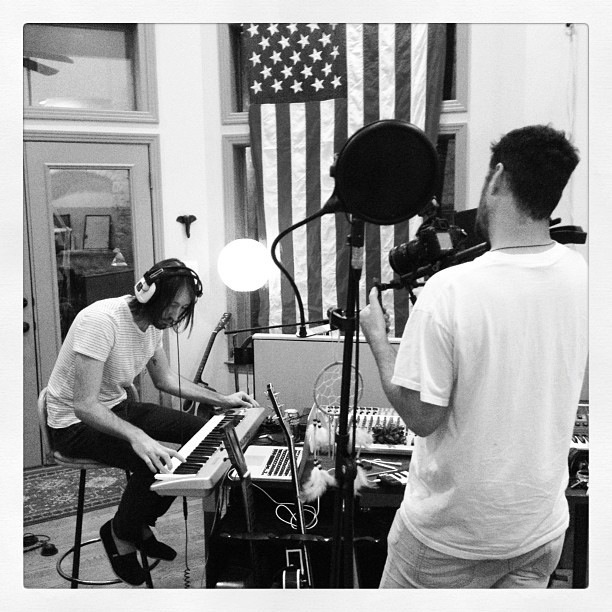 We are here for two weeks while Joey records guitar for the upcoming Israel Nash album with some of our closest friends. 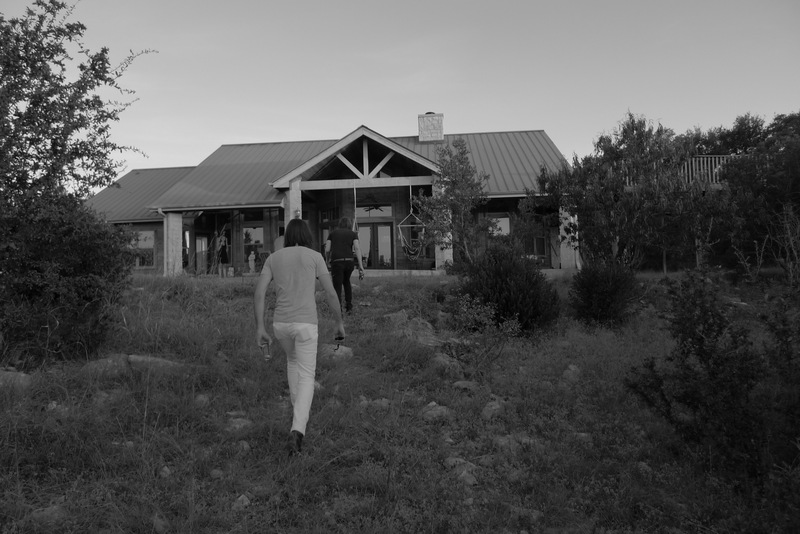 The setting is perfect for recording an album: there are nine of us holed up in a big ranch house that is surrounded on all sides by tree and cactus-covered hills. The closest neighbor is over a mile away; too far away to be disturbed by any music that goes late into the night. 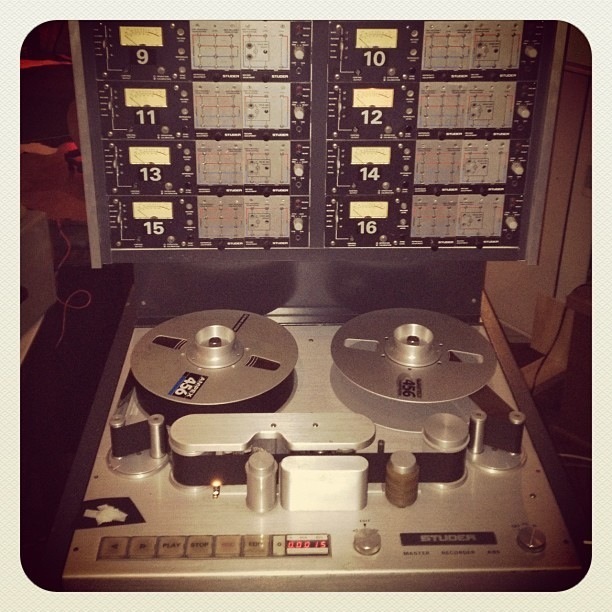 The cathedral-ceilinged living room has been transformed into a recording studio; the cowhide rug on the floor is crisscrossed with cables running from the many guitars and amps to the mixing board and analog tape machine. As the band sets up their gear, my friend Laura and I set up our gear. We are staking our claim to the two lounge chairs on the back patio that overlook the valley that provides a stunning view at sunset. It is an idyllic setup for us: the guys will record their album while we lounge within earshot of the music, knitting away and enjoying each other’s company. I’ve brought along a ball of tweedy yarn and some circular needles and a vague idea for a slouchy hat that I want to make. The day fades quickly into night and I find myself knitting stitch after soothing stitch as I listen to the sounds of a song coming to life. 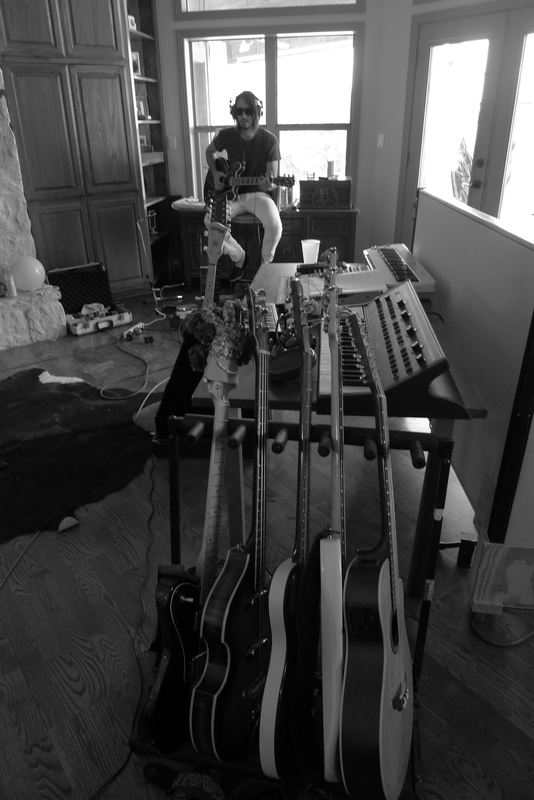 The song they are working on has a dark and beautiful sound, and has most definitely been inspired by our isolated surroundings. It is the ideal soundtrack for knitting and watching the moon rise above the hills. One afternoon we decide to go on a walkabout to tour the natural springs that are in the area. We hike down into the valley, careful of our footing as we walk over chalky white rocks and through dry branches and thorny grasses. 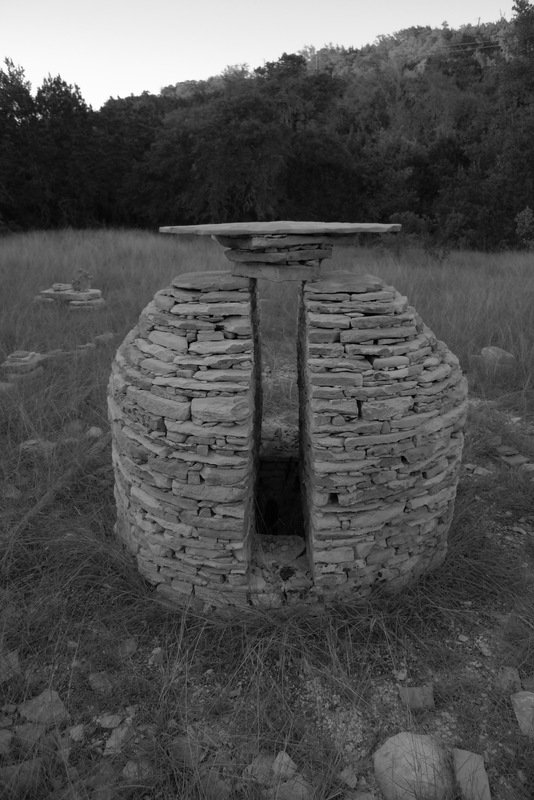 There is an artist living nearby that creates intricate sculptures out of the flat rocks that are abundant in the area and we happen upon a few of her works and study them with appreciation. As I survey the many precisely-placed layers of rocks, I am reminded that much like recording an album or knitting, some of the best creations are made slowly by building layer upon layer, stitch upon stitch. 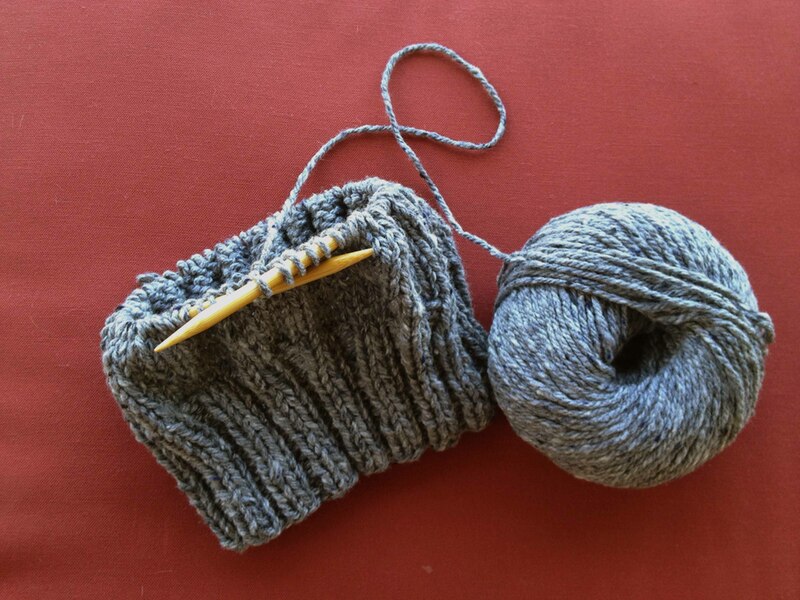 As the days pass by, my hat is taking shape at a leisurely pace. I’m picking it up and putting it down often between dips in the swimming pool, walks to pick wildflowers or trips into town to refresh our stores of food. I’ll knit a few rounds as we’re all sitting around in the evenings, listening to the day’s work and discussing the songs left to be recorded. Just as I’m not in a rush to finish my hat, I’m not in a rush for my time here to be over, but before I know it I am binding off and weaving in the ends and packing my bags into the car to head home. Our trip has been full of so many fun memories that are forever linked in my mind with the songs that were recorded while we were here. And when the album is released and I hear the songs again, you can bet I will also be listening closely to see if I can hear sound of my knitting needles clicking away in the background. 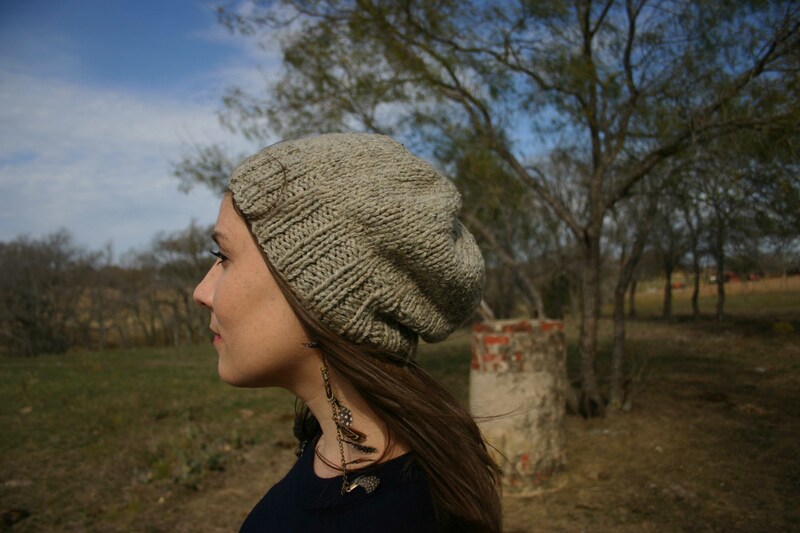 Originally published in Pom Pom Quarterly 4: Verdant Stitches, I’m happy to now offer the Hill Country Hat knitting pattern as a free Ravelry Download. 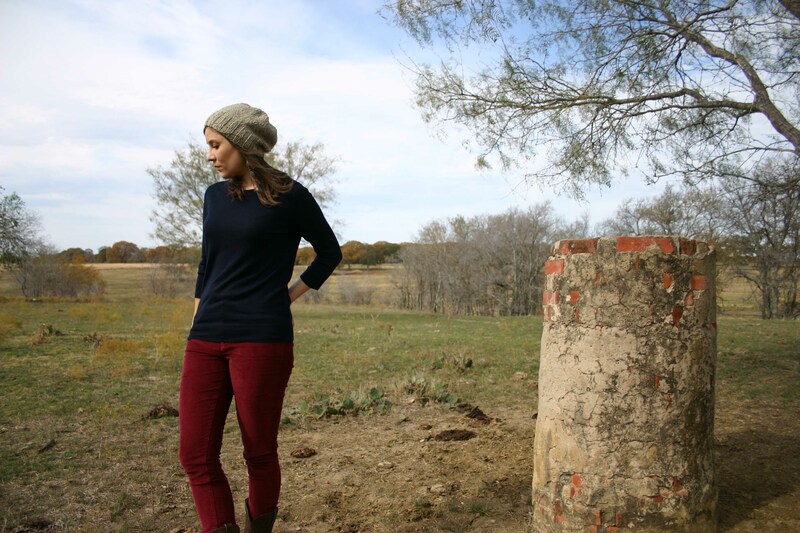 The Hill Country hat knits up quickly in a bulky weight yarn and has a good amount of slouch. The finished size is 20.5 inches in circumference by 9.25 inches long, brim to crown. Fast forward 17 (!!) years later and things have changed yet not changed. Joey’s wardrobe consists of mostly greys, with some black and navy thrown in for good measure. If you ask him his favorite color I am positive he would still answer with grey. Me, I have nary a bit of cobalt blue around anymore, save for a set of baking dishes that were a wedding gift; a throwback to our early days. Over the years I’ve most certainly come around to grey as a color. Without even knowing it was happening, it might have just become my favorite color too. 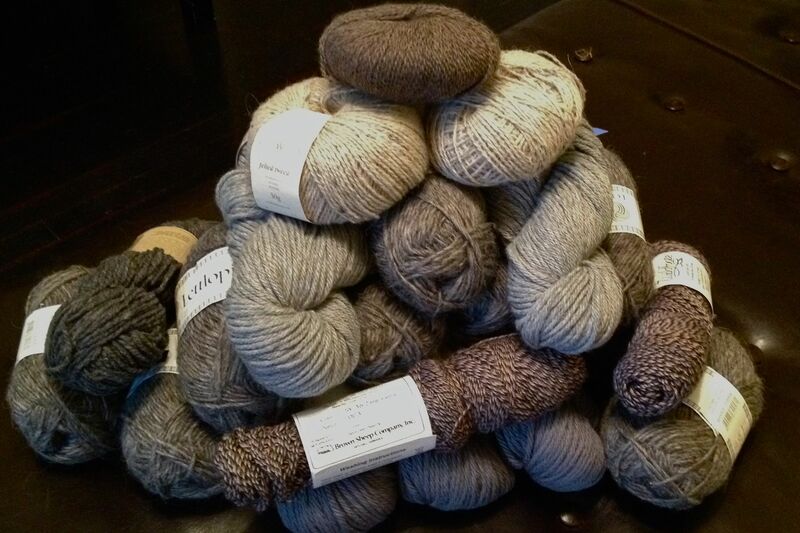 I was yarn shopping with a friend the other day and she commented that when it comes to yarn, I almost always go for greys and I realized she was absolutely right. 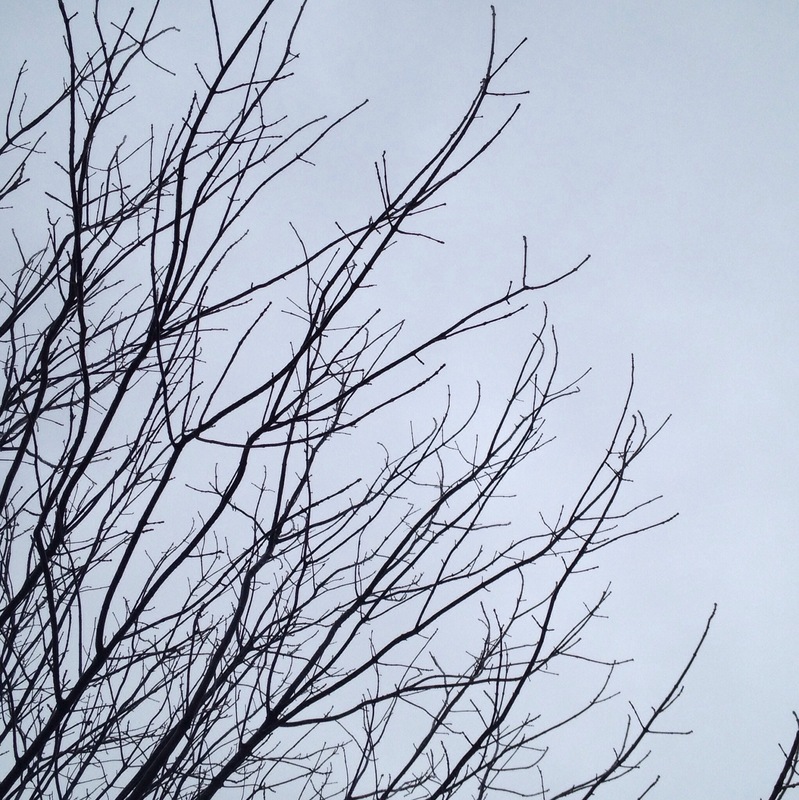 Today the sky is grey as grey can be and although I am a bit tired of cold grey weather, I’m not tired of grey the color. Not even a little bit. A while back I started playing around with arrow motifs and incorporating them into my knitting. 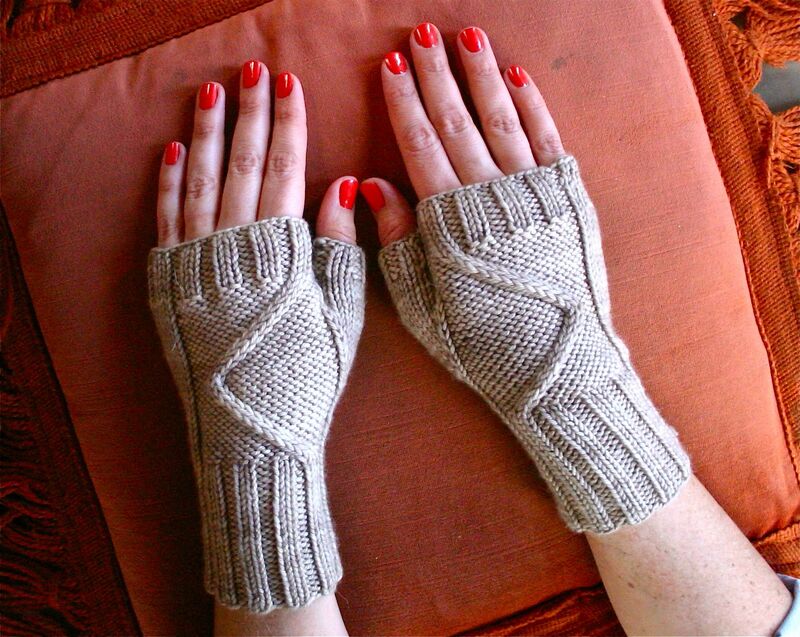 The Wayfinder Mitts were originally envisioned as a pair of grey stockinette fingerless mitts with an orangey-red arrow down the back of the hands, either knit using intarsia or possibly duplicate stitched on afterwards. After a while that idea started to feel too plain and I tried to think of a way to make them more interesting. I came up with an interesting stitch pattern for the cuffs that also featured directional arrows, but then I fell in love with the cuff idea more than the original idea and decided to file that particular stitch pattern away for something bigger and better. Another issue I had with the idea of doing a stockinette mitt is the fit. I wanted something that was fitted– not slouchy, so I knit a prototype that decreased towards the wrist and increased for the hand. Unfortunately when wearing the mitts, they would bunch awkwardly when you rotated your hands at the wrist, so I went back to the drawing board. Some of the best-fitting fingerless mitts I’ve ever worn have had ribbing on the wrist portion, so I went with a 2×2 rib for the arm and wrist and stockinette for the hand and added a two stitch traveling cable to the back of each hand for the visual interest. I really like the way these mitts turned out and the ribbing makes them easily stretch to fit most ladies’ hands nicely. This pair was knit in Madelinetosh Tosh DK, but they could also be knit in a heavy worsted or aran weight in a more rustic wool for a pair of manlier mitts. The pattern is being tech edited now and I’ll be releasing it very soon! I’m a lazy knitter. Not the kind of lazy knitter that makes mistakes and doesn’t bother to fix them— (I may be lazy, but I’m still a perfectionist). No, I mean the lazy kind of knitter that will set a project aside if there’s a section coming up that I need to devote my full attention to like calculating increases or looking up a particularly stretchy bind off. That is exactly what happened to me recently and it spiraled into an entire month of no knitting. I’m slowly slogging away at a design idea (perfecting it, actually) and I was getting near the end of a ribbed edge where I wanted to try out a tubular bind off. I set the project aside, planning to research the best method of doing the tubular bind off, and then a crazy insane December happened and I kept thinking I didn’t have time to do it properly so it just sat there. For a whole month. Not a stitch knit. Fortunately, my knitting mojo has returned post-holidays and I found some time to pick it back up over the weekend. The first thing I noticed was that all the ribbing I had knitted back in the insane days of December was worked in the wrong needle size. 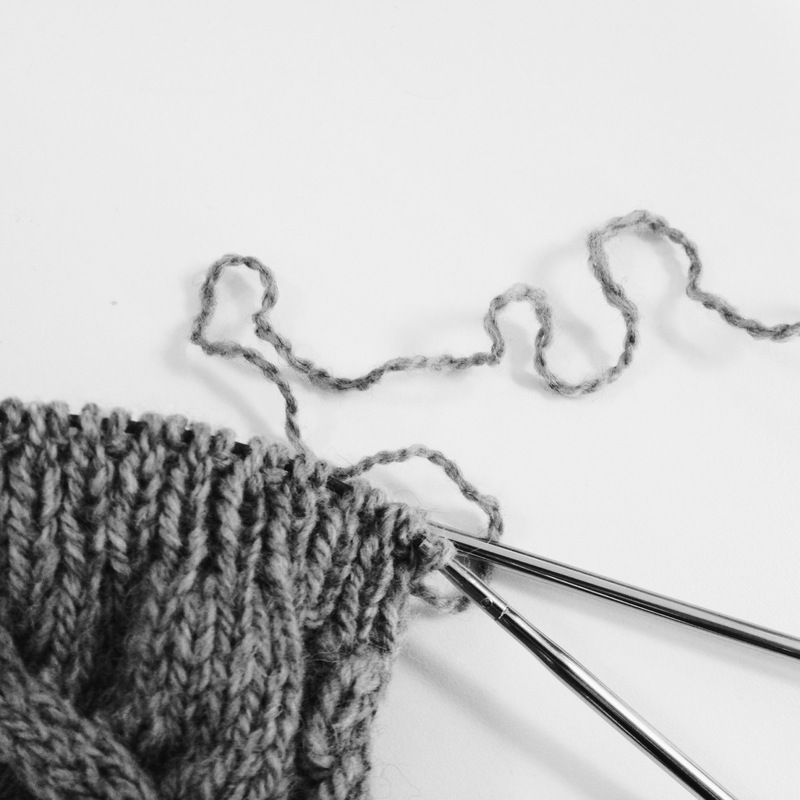 (What kind of burnout makes mistakes knitting their own pattern? Further proof that December was just a crazy month that I’m glad to see the end of). So instead of spending a nice hour or so knitting a beautiful tubular bind off and feeling the satisfaction of completing something that’s been on my mind for a month, I had to rip back quite a bit of ribbing and then start over with the correct needle size. All of that and I’m still not ready to tackle that dang tubular bind off. The good news is that even though this design is taking me FOREVER (I’m not even going to talk about how I’ve got a whole second piece to REKNIT after this one….) it’s going to be a really killer design so it will be worth all the trouble. AND I’ve recently brushed off another design that has been waiting in the wings since summer time and all it needs is a quick tech edit and some photos, so I should have something to release fairly soon. Oh December, you were harsh but beautiful. The month started out with Joey heading back out on tour and me and our little Henry-dog getting snowed in by a big ice storm. As temps dipped into the teens and everything was covered in six inches of solid ice, Henry and I cozied ourselves up as much as possible. I made giant pots of soup and drank lots of tea and knitted while Henry would snooze on my lap. We ventured out on the ice for a few walks to try to combat cabin fever, and even decorated the house for the upcoming Christmas holiday. (Yes, I covered everything in yarn pom poms!) As things finally started to thaw out, I wrapped a few small gifts to put under our tree and waited impatiently for Joey’s tour to wrap up. As it turns out, I couldn’t take the full three weeks away from Joey so I drove down to Austin to catch the band’s show one Friday night after work. I also got to visit with lots of friends that I haven’t seen in a while, which was really nice. We spent a few nice days with both of our families for the holidays and are now gearing up to head out for a couple of New Year’s shows in Aspen. (Thank goodness I get to tag along this time!) 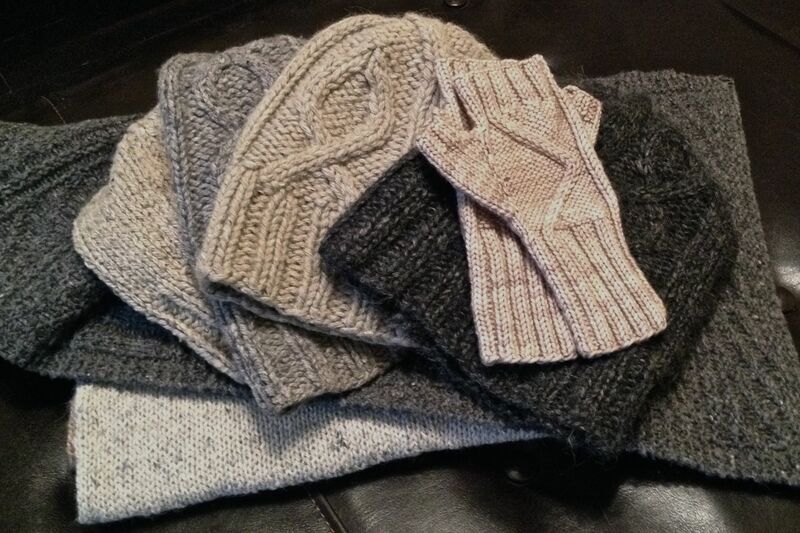 Now I’m trying to decide which handknit hat I should bring for the cold Colorado weather…. Happy New Year to you and thank you for reading! 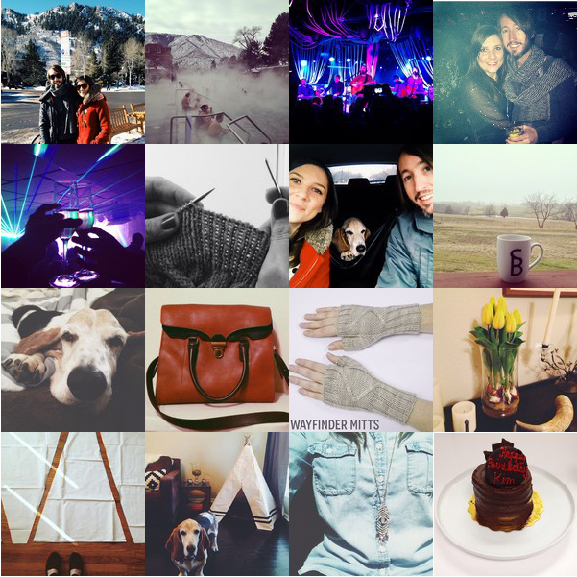 This is the week when everyone can finally reveal what crafty things they’ve been making for Christmas gifts, right? I only have one small handcrafted Christmas gift to show, but I was really pleased with the way it came out. 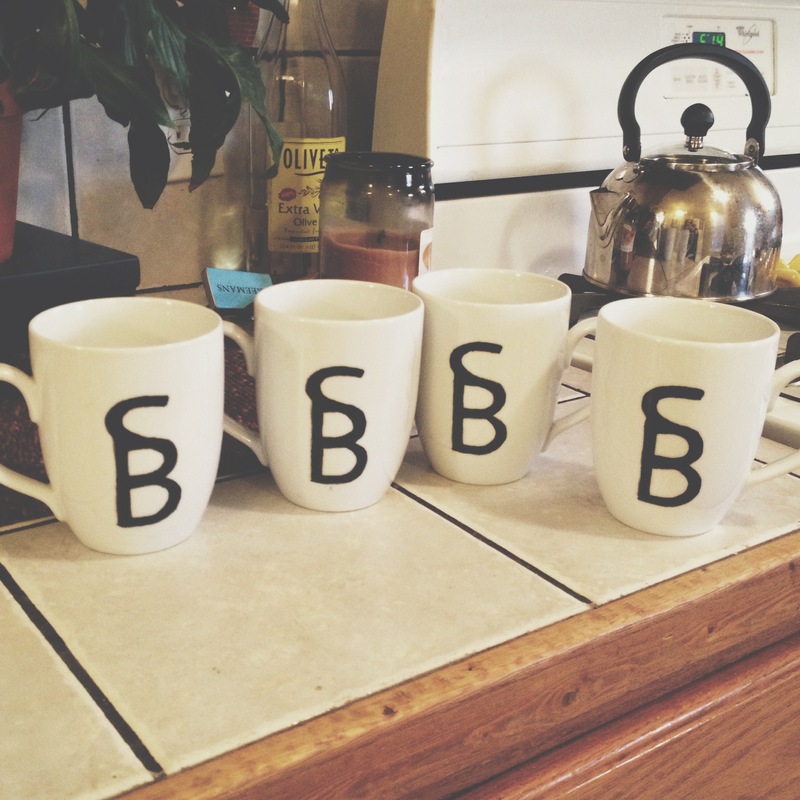 I made my parents a set of coffee mugs emblazoned with their Sandybrook Ranch cattle brand. I created the brand in Illustrator and then printed it out and traced it onto the mugs using graphite paper and then filled in the design with black porcelain pen. I baked them in a 350 degree oven for 40 minutes to set the ink and that was it! My parents really liked the gift and I’m sure next time we go to visit they’ll be sipping their morning coffee out of their new Sandybrook Ranch mugs. November started out with Joey still out on tour and me adjusting back to home life after my trip to visit him. The band played the Iceland Airwaves festival in Reykjavik and Joey brought me back some lopi wool as a souvenir. This leg of the tour ended with the guys playing two shows opening for Pearl Jam in Dallas and Oklahoma City and I went along for those shows. It was a good time and it was really fun to get to watch the guys play in front of such large crowds. I spent a little time working on charts for a cabled knitting pattern I’ve been working on, and decided I wanted to make a few tweaks to the cables I have been using. The design is going to be a really good one and I’m glad I went back and made the changes, but that also means I have to reknit an entire piece of the design and with the small amounts of knitting time I’ve had lately, it seems to be very slow going at the moment. I’ve also been enjoying having Joey back home for a few days before he heads out again until Christmas. Henry sure hates it when he leaves, so we make sure to spend lots of time snuggling and watching movies in bed when he’s away. We also got to spend a couple of nice days with family for Thanksgiving, which is always a good way to move into the month of December.